It’s a great thing when you realize you still have the ability to surprise yourself. Makes you wonder what else you can do that you’ve forgotten about. You may have noticed that I’ve taken things in a slightly new direction. Clips and quotations from the rest of the web. Bits of text dragged in from elsewhere. Words kidnapped to my main page. Images, innocuous and well-mannered, but nonetheless victims. Acts perpetrated to sate my desire to collect. It’s a slow starting trend, starting with that irregular institution The Saturday Photo. That was my first attempt at ‘borrowing’ things that caught my interest on my sojourn through the world wide web. It’s not been a regular feature, but frequently there’s been something worth seeing on a Saturday morning. The main motive for this change, that beating heart in a willingly black soul, has been MSN. As I’ve had more conversations that are irreverent and random, I’ve started to share with my friends the bits and bobs that I find out in the ether. With the blessed powers of Stumbleupon to call forth this deluge, I find something every day that expands my horizons. Some of the trash would shame the upright amongst you. Some are genuinely interesting and artistic, showcasing the ingenuity and creativity that Talking Meat can exhibit. Some of it is sheer out of the box thinking, of such quality and clarity, that its genuinely hit me hard when I’ve taken the chance to reflect on it. Most of it’s puerile 20 something male stuff. Don’t worry, that I won’t be sharing. 20 years of cultivating a false persona as a pseudo alive intellectual that doesn’t live his own life as much as observe it won’t fade away that fast. 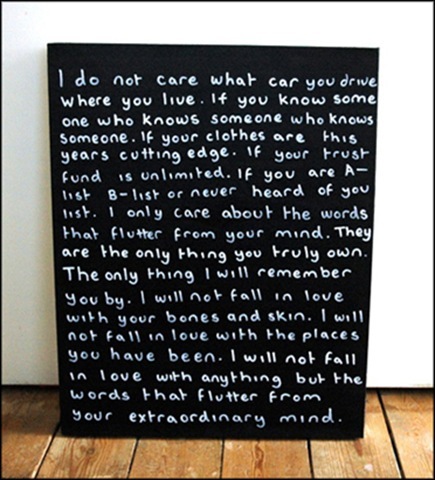 Nor will my inherent defensiveness and caution. But I’ll take a few more risks. When I find something that catches my attention, something unique, quirky or interesting, I’m going to put the power of Windows Live Writer and Firebox to work, and am going to smack down a link to it on my blog. You see, as much as this is my art, it is also my collection. It is my little set piece play, to choreograph and control. Akin to a museum curator, even one who is delusional about the value of his own work, I shall include the best that I find outside here as well. The biggest auction yet of original works by graffiti artist Banksy has exceeded its estimated takings. The 10 pieces and a print were expected to raise a maximum of £300,000 in total when they were sold in London at auction house Bonhams. However, the works actually fetched £546,000 altogether. The colours, the vibrancy and the high intelligence in the good stuff. I’m not talking about youths who never learned to draw but want to leave their mark on the world. That’s pedestrian. No better than vandalism. 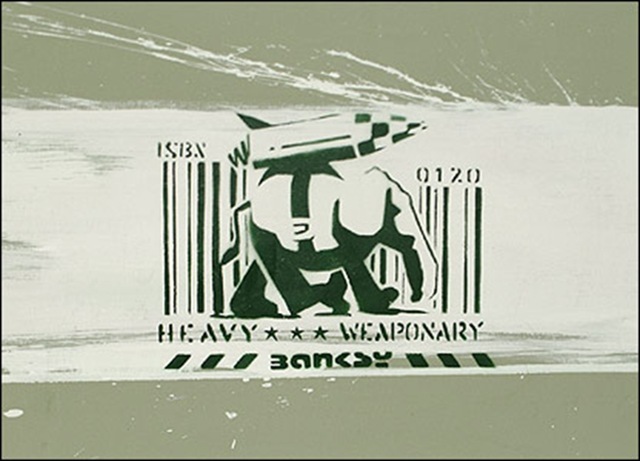 People like Banksy, who have found the art in the medium, who do the kind of work that is in Ganz’s book, that’s true art. I find its a style and form to admire. I find it captivating. I’m a fan of Banksy’s work. Banksy is a well-known yet pseudo-anonymous English graffiti artist. His works are satirical pieces of art which range across politics, culture, and ethics. His street art, which combines graffiti with a distinctive stenciling technique, has appeared in cities around the world. They’re clever, challenging, sophisticated and open to interpretation. I wonder whether Banksy means all that you can find. It doesn’t matter though at some level. An artists work speaks to the viewer, and meaning is for the viewer to find. The Artist can only suggest possibilities. His work is often targeted at elites and authority, but also more broadly; at all of those who see the status quo as acceptable. Part of that is the medium, graffiti is always going to be a counter-culture medium. A way to reclaim space from the corporate hands that have allocated public space away to billboards. A way for the part of society society that doesn’t operate on the formal social plane to use space to get their messages out and across. To reclaim some space from the Advertisers. What I find interesting about the BBC article is the beautiful contradiction. An artist who professes a disdain for the modern order. Who feels that it strips people of their dignity, power and prevents them being free. Who feels capitalism and commercialization are the curses of the modern age, where all experiences are the same. This artist, having his work bought by the elites at inflated prices. Work that was spray tagged, that might be painted over by an over-zealous Borough, transformed into a high value commodity because the elites recognize when they’re being mocked and find it funny. Gap said it was unaware that clothing intended for the Christmas market had been improperly subcontracted to a sweatshop using child labour. It announced it had withdrawn the garments involved while it investigated breaches of the ethical code imposed by it three years ago. First that big companies no longer get away with exploitive globalization. Reporters are checking their supply chains and the resulting publicity rebounds badly on their key selling point, the Brand. When you sell an image, things that damage that image require supervision. Secondly that consumers are more interested in stories like this and aware of them. It’s on the front page of The Guardian, even when the leg work was done by The Observer. Consumers want to be ethical in their spending and won’t accept overtly exploitative behaviour. At the same time this story will disappear within a few weeks and those same consumers will forget. Once you establish a dominant image in peoples’ mind, it takes a lot to uproot the default assumptions. Finally, that India’s economic miracle is coming at a similar price to China’s. I’ve shared esoterically my disquiet about the way these miracles happen and the human price paid for progress. I freely confess that I have no idea how else it can be done, or how this choice can be made between progress and exploitation, or even if any balance is possible. You have to work out what the letters mean. It doesn’t matter if you write the answers in uppercase or lowercase, but the answers must be exactly as expected (no additional intervals or dashes and the spelling must be correct).There is no time limit for this test. Answers will automatically be verified as you type ’em. I did 16 in about 20 minutes while watching Numb3rs and then the TV show got more interesting. I’m going to go back and finish it off when I muster the motivation. I found it a fun challenge requiring some parallel thinking and some cultural knowledge. It’s definitely grounded in the US of A so it helps if you think inside that box. A lot of it is universal though. Give it a go and tell me what you think. 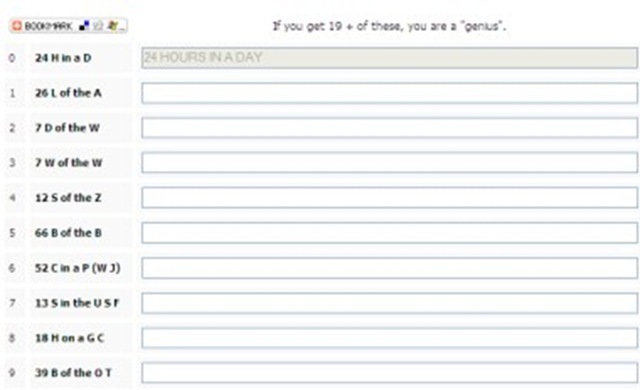 Remember, if you get more than 19, you’re a genius. Most mosques in the Western world pose no threat to non-Muslim citizens; but a few do pose such a danger, because of the hatred that is preached in them. In such cases police forces generally have the legal armoury they need to step in and make arrests if necessary. Quashing extremism will surely be easier in an atmosphere where the founding and running of mosques is an open, transparent business. As Nicolas Sarkozy, the French president, once said: It is not minarets which are dangerous; it is basements and garages which hide secret places of worship. Will someone please tell the Swiss? Politicians from two of the biggest political parties are seeking to insert a sentence into the country’s constitution forbidding the building of minarets. Measures of this sort exemplify the bigotry that lies behind much of the opposition to mosque building in Europe. Christians in the West have long complained about how hard it is for their brethren in Muslim lands to build churches. Fair enough. But they should practise what they preach. I’d never though about this before. It puts the building program that Maula has carried out in the Western world in perspective, explaining why its still much harder in Western Europe, where progress has been, and continues to be, difficult, compared to the USA where the difficulties have proven easier to surmount. Generally it seems Protestants are more forgiving of strangers in their midst compared to Catholics. Common Law countries also seem more welcoming than civil law countries. Is any of this causation as opposed to mere correlation? Not a clue. EDIT : Zed has rightly pointed out that I should have used the word masjid in the title of this post, which is the proper Arabic word for mosque in the bohra community as well as in the broader Islamic world. I’ve decided to leave this post unchanged for the moment, and am writing a post on how we use words symbolically as well as for their meaning to give this observation and its implications proper thought. I’m a HUGE fan of Calvin and Hobbes. Like “has every strip on his hard drive and has read them multiple times” huge. 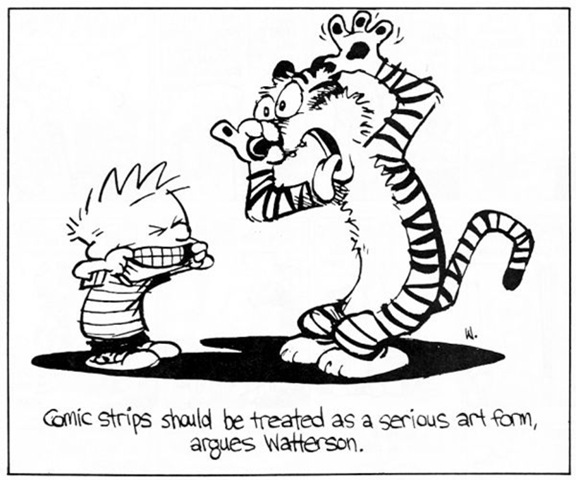 Which means that sites like this, offering new sketches and fresh material on those two rascals or their recluse creator, Bill Watterson, brings me instant joy. This much new material, so much of it which I’ve never seen before, is nirvana. I wish I’d written this. Still, not absolute Truth though. A part of Truth. A part. “Personal relationships, particularly romantic ones, can be the INTJ’s Achilles heel. While they are capable of caring deeply for others (usually a select few), and are willing to spend a great deal of time and effort on a relationship, the knowledge and self-confidence that make them so successful in other areas can suddenly abandon or mislead them in interpersonal situations. This happens in part because many INTJs do not readily grasp the social rituals; for instance, they tend to have little patience and less understanding of such things as small talk and flirtation (which most types consider half the fun of a relationship). To complicate matters, INTJs are usually extremely private people, and can often be naturally impassive as well, which makes them easy to misread and misunderstand. I’ve always liked personality tests. I guess its part of that whole wanting people to make sense thing. 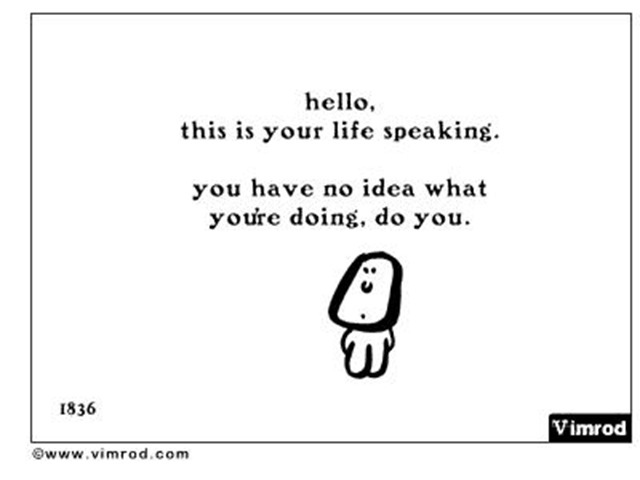 This is Your Life Speaking….